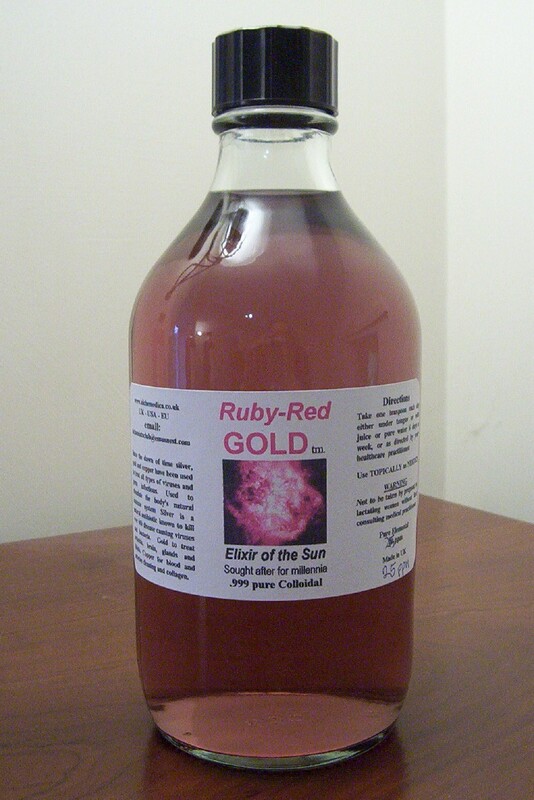 The Alchemists goal is finally achieved after 5,000 years of searching - how to improve human health in body and mind, utilizing gold, and presenting it in a safe and organic way to enable human use both orally and topically......Well - we've done it with Ultrafine Colloidal GOLD and Ruby~Red GOLD....so for you,.. are the benefits - use and become immortal? Ultrafine Colloidal Gold. Calms the whole neural system, increases IQ, libido, helps equalize heart rhythm, relieves arthritis + more. Gold has been used for centuries in treatment for arthritis and parkinsons disease. 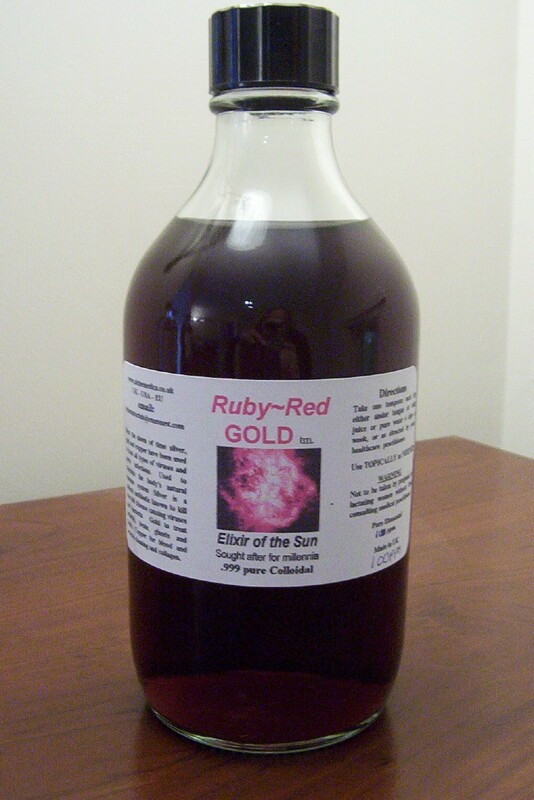 Colloidal Gold is for neural system, nerves, stress, IQ. helps maintain the heart's natural rhythm, arthritis, libido, and brain function. IQ increased by as much as 25%-35% in latest clinical tests, also effective for treatment of A.D.D (Attention Deficit Disorder) for adults and children. Encourages restful relaxed sleep. Also found to be very beneficial for skin care when applied topically. 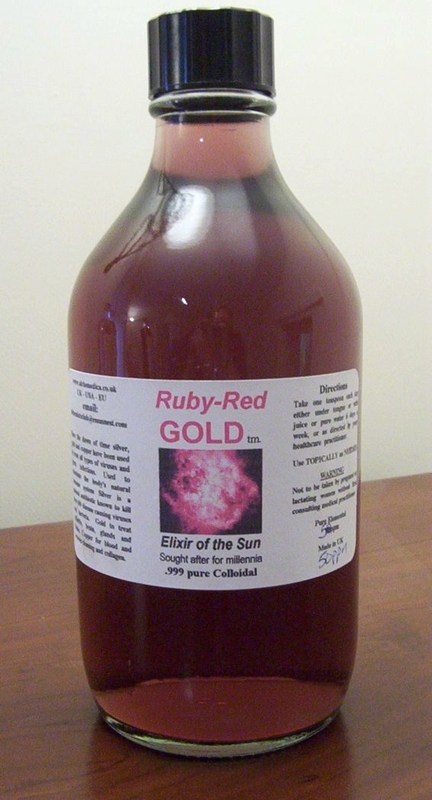 The fantasmological effect of a ruby color emanating from a clear glass bottle of water which contains no coloring agents whatsoever and is only caused by light refraction from millions of microscopic micro particles of pure gold is truly awe inspiring. The knowledge about using gold to produce a ruby red color was known as far back as the original making of ruby red glass. But to achieve all of this it was necessary to mix in additives of nitrates or chlorides to achieve the color. 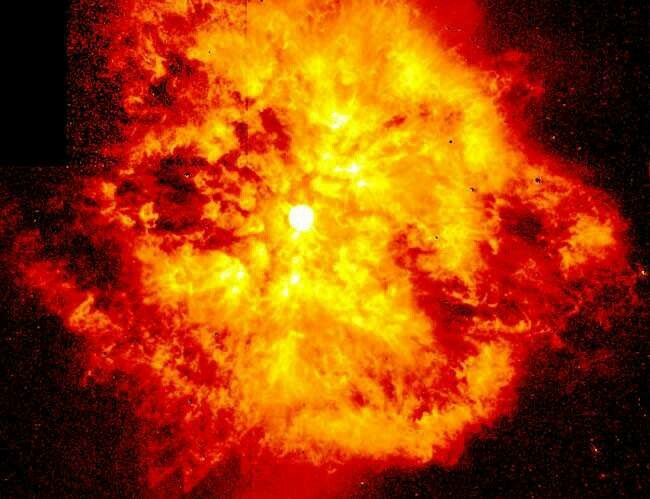 Now at last, by harnessing the same concept as the sun uses to achieve its own rebirth of golden energy, we can create miniscule nano particles of pure gold so tiny that they become denser in the surrounding water and offer a combined much larger area of refracted light gerneration at the ruby red end of the spectrum. All of his means we have an even more effective ultimate colloidal gold for health and beauty solutions. Ruby-Red Gold tm. All four strengths are available in two sizes = 50ml and 100ml. A true Liquid Gold to strengthen the Mind, Body and Soul. 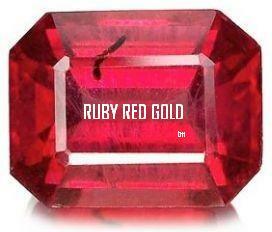 Named Ruby Red Gold after its natural beautiful ruby red color at between 50ppm and 100ppm. Nothing added other than nano particles of gold in pure distilled water. 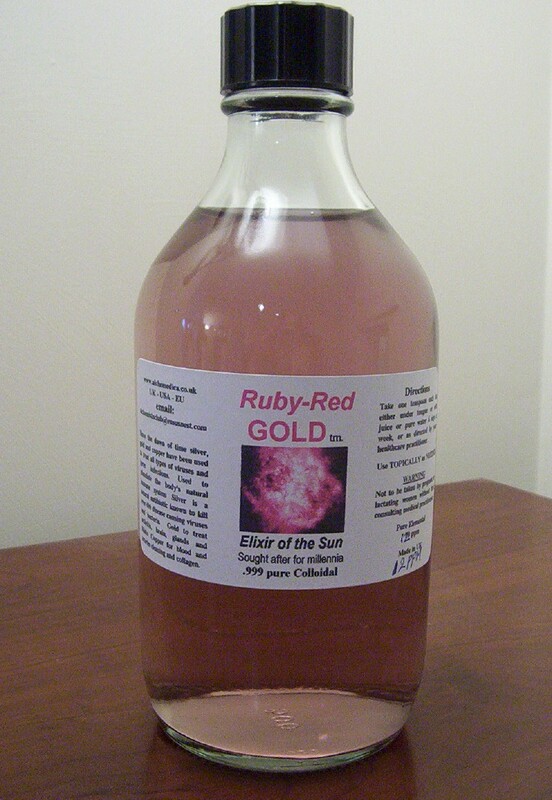 Ruby Red Gold is created utilizing physics technology stolen from the sun. It is pure ultrafine Colloidal Gold at its finest. The half liter clear glass botles shown here, are only being used to represent the individual diferent ppm colours of the four colloidals and are not sold with any of our colloidlals. - only available in amber bottles. All clear glass botles shown here, are only being used to represent the individual diferent ppm colours of the four colloidals and are not sold with any of our colloidlals. 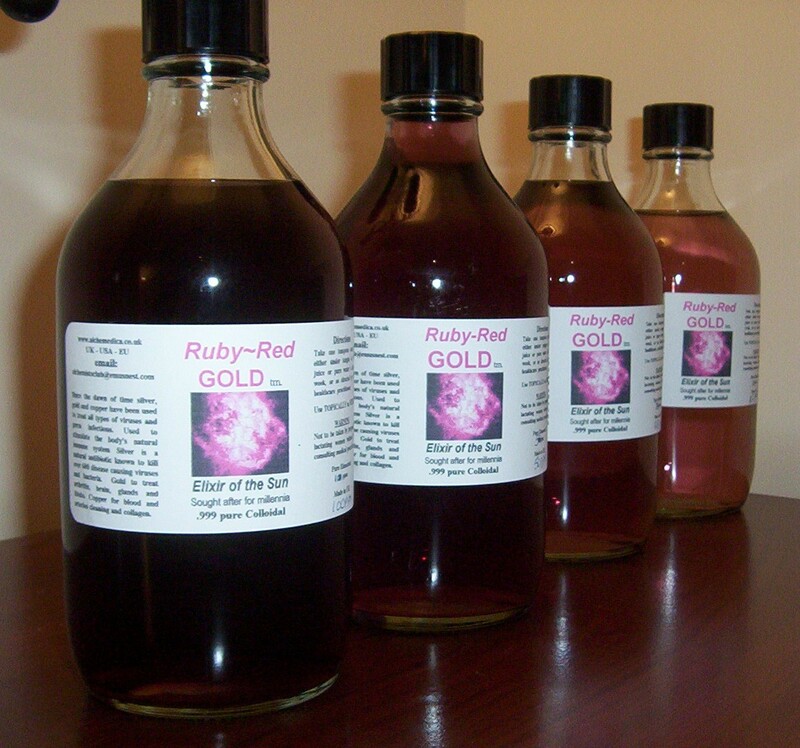 - only available in amber glass bottles to maintain quality and effectiveness.